Dont we all want that beautiful celebrity smile – straight white pearl like teeth. But are you worried or nervous about the wearing braces? If you have been avoiding braces because you are nervous about wearing them and you dont know if its right choice for you, its time to talk with me about Invialign. Invisalign is clear alignment tray which allows you to meet your goal of beautiful smile both comfortably and quickly. 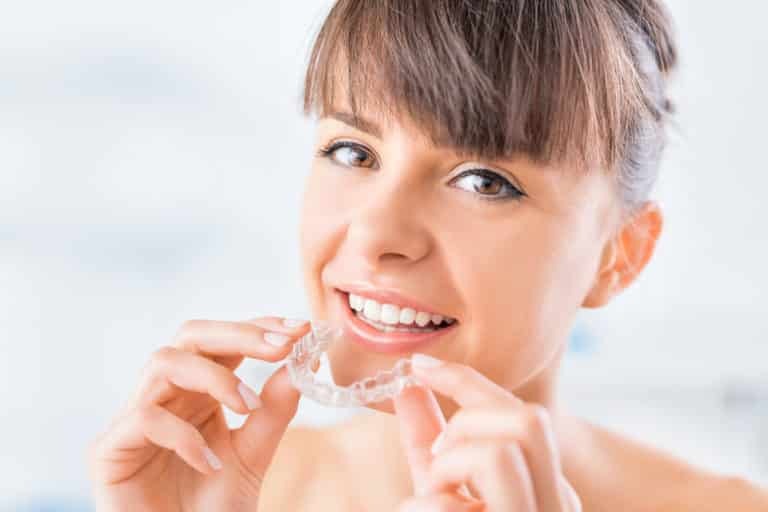 In my blog, I will help you make decision if Invisalign treatment is the correct option for you to straighten your teeth. Unlike braces, Invisalign does not use brackets and wires to shift teeth. Invisalign is set of clear plastic trays that fit your teeth and are called alignment trays. Each tray when wore considerable amount of time works to move your teeth in correct position. My patients normally wear trays for three to four weeks to get desired results. Once I see progress on teeth movement, I give new set of alignment trays to my patients for next set of changes. During the whole treatment plan that can take anywhere between six to twelve months, you will visit my office every four weeks for check up and treatment progress. Wearing alignment trays is comfortable and easy to remove and are very smooth. If you have sensitive gums, Invisalign trays give you easy experience both during day and sleep hours. Invisalign treatment is hassle free. You dont change a thing in your lifestyle. Same diet, same oral hygiene routine. Its as simple as removing your alignment trays and start enjoying your favorite food. Brush and floss according to your need (ofcourse, I recommend twice a day) and pop your alignment trays back in for continued treatment. Speed of Invisalign treatment is faster than traditional braces. You need fewer visits to my office and overall reduced treatment time to achieve beautiful smile. Visit my dedicated Invisalign page for more information.